In the past week Yidio has enabled some great new features on our website and in the Yidio Alerts platform, all of which are designed bring to TV you. 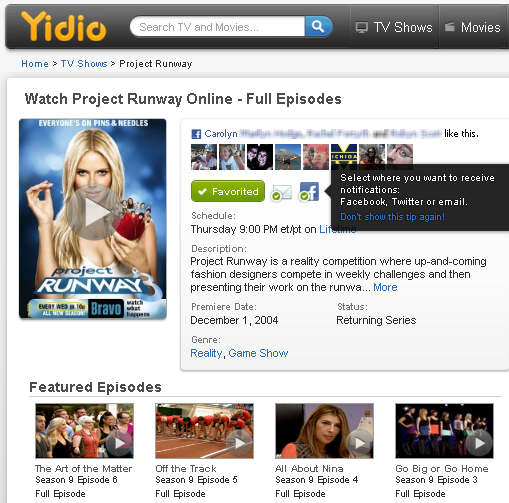 Now, all your favorite TV shows can be configured, managed and viewed in the MyYidio section of the website. Start adding favorites by linking your Netflix account and connecting with Facebook. Then visit My Feed for a real-time stream of TV episodes, news and airing information on the shows you’ve selected as your favorites. Enable personalized alerts by selecting your channels — email, Facebook feed or Twitter feed. Signup now to get started! Whether you’re a TV addict with hundreds of shows queued up on your DVR, a cord-cutter who only streams one or two shows as they appear on Hulu, or somewhere in-between mixing and matching American Idol live with the Daily Show on your DVR there are more ways than ever to watch your favorite TV shows. 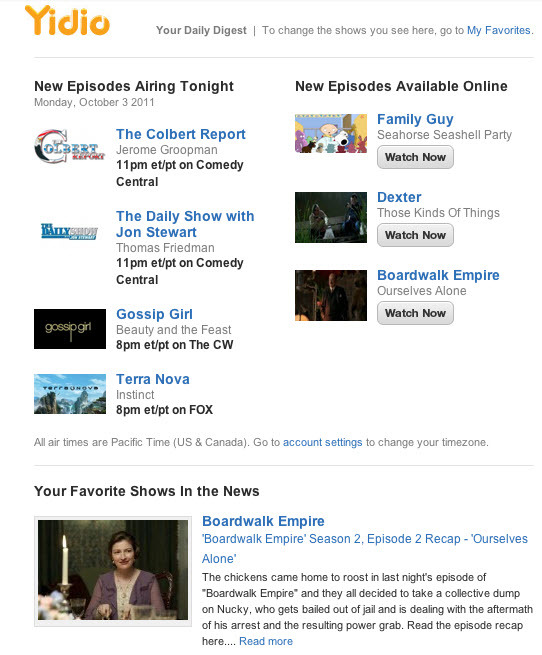 Yidio has rolled out a new way to bring TV to you, in the form of a daily digest of your top TV today via email. Customized strictly to your favorite shows, you’ll know what’s on that day and night by checking your inbox. Yidio emails you the only customized daily digest of what and where to watch on-air and online. Here’s how to set up and try the alerts digest for yourself. First, login and update your favorite shows for the Fall season. Then you can go to your Settings from the right top corner, and check the list for Daily Digest. Then check your email and start watching! Brandon Eatros talks about what is ahead for Yidio in an interview with Oobly at SFBeta. With TechCrunch Disrupt drawing entrepreneurs and angels from afar by day, Yidio presented at two local video/connected TV events this week by night. Starting with a demo of the new Yidio Alerts platform and our Facebook Connect integration at SFBeta we were in good company alongside YuMe, VidCaster and Squrl, among others, at 111 Minna. Then we offered a sneak peek of our upcoming mobile apps at the LeanBack Meetup by AdRise, as always an engaging crowd of video advertising, social TV and connected television entrepreneurs. This week underscored that SF is home to some of the most exciting start-ups and game-changing ideas in disrupting the traditional television experience. See who likes your shows. 1. 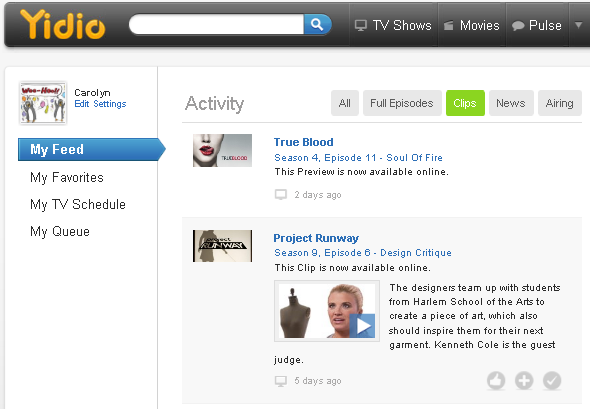 More social features like “Faces” for show pages, where you can see the friends that like the shows you are looking for on Yidio. You can also set up alerts for favorites directly from the show pages that will provide updates on show airing, episodes available on line and news stories in your Twitter, Facebook newsfeed or via email. 2. Tons of extra footage, interviews, trailers, sneak peeks for the Fall season and other clips for your favorite shows are being added daily. 3. Yidio News provides the latest breaking stories centered on actors, TV show celebrities and red carpet events. For all the hottest entertainment stories check the Yidio homepage. Make sure to login and visit the “MyYidio” section to see a personalized activity Feed that allows you to browse airing episodes, recent clips, and news customized by the shows you select as your favorites. Now you can see only the most recent and most relevant TV content for you. Come out and to see us show off our latest platform updates including improvements to our recently released Yidio Alerts. A great new TV guide alerts service to keep you up to the minute on all your favorite shows, just in time for Fall TV lineup. The SF Beta 6.0.0 demo theme features startups building creative and innovative approaches to video and photography, on September 13th at 111 Minna. Sign up to attend now for what’s certain to be another sell-out event. Anyone developing mobile apps for TV should check out George Winslow’s excellent piece at CableBroadcasting, View Along the App Landscape, surveying TV apps from interviews with 25 TV executives. While networks have had early successes launching second-screen apps that accompany TV shows, like the ABC Grey’s Anatomy app and The Royal Wedding by NBC News App for iPad, iPhone and Android that surpassed 200,000 downloads, executives in digital and mobile admitted to still refining the business cases for companion apps. TV Everywhere apps are now taking the stage for networks like ESPN, CNN, and Turner, all of which continues to emphasize the complexity of TV offerings that fans need to navigate to access content and watch their favorite shows.